I received a gift card from Bing for being an influencer on KLOUT along with an invitation to their Do Something Summer. 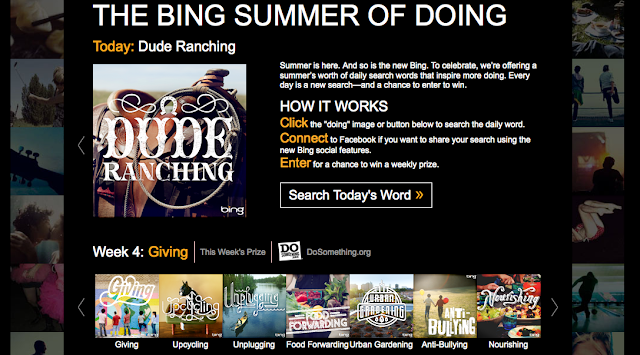 Each day bing is offering up a word or phrase to inspire us all to live a little in their Summer of #Doing event. I checked in and found that the phrase of the day was "Food Forwarding" which is all about sustainable food and was perfect because I had been wanting to have an organic pizza party. I immediately searched bing for ways to make sustainable pizza, shopped for my sustainable and organic ingredients and invited some friends over for a party. My friend, who rarely purchases organic or sustainably, even did her part with some organic and local ingredients for her salad. The only thing I didn't do was head to our local winery for our wine. We cheated and had some of my friend's favorite, non-organic wine but the afternoon was still a blast. Taking part in the Summer of #Doing means getting some really unexpected ideas for fun and the opportunity to win some great prizes. Follow along on bing's summer of #doing with people and organizations all over the world, including stars like Nicole Richie and DoSomething.org by checking out their daily search phrases at www.bing.com/doing. 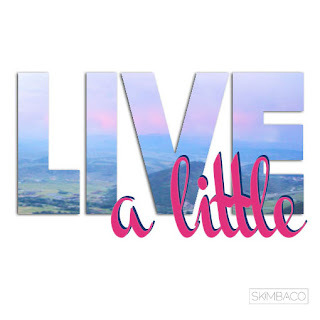 Then go live a little and get busy #doing something!